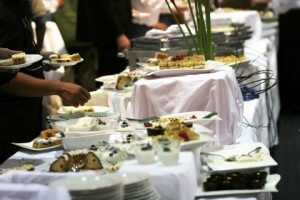 Planning a corporate event is no picnic, there are so many things that need to be done. Typically, if you are planning a major event featuring keynote speakers and out of town attendees, you need to get this ball rolling eighteen months in advance. Let A Catered Affair Help With Planning! Those with the responsibility of planning corporate events begin by determining event goals and objectives. They work on discovering keynote speakers and plan an agenda. There are budgets to contend with as well as financial reporting and procedures. After they establish dates and prepare a guest list, then the negotiation for hotel rates can begin. Then comes the task of preparing and sending of the invitations. The person in charge of the event will also need to prepare for the details like registry protocol, schedules of events and speakers staff assignments. Basically, there is a lot of planning that goes into corporate events. Even the smallest of details cannot be overlooked. 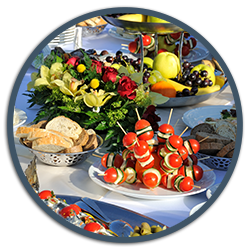 We carry out our corporate catering like you carry out your planning of corporate events. There is a lot of work, preparation and planning that goes into each and every corporate event that we cater. Like you, we know the importance of these events and we make sure every last detail is covered so you have one less headache to deal with. So the next time you plan a corporate event, make sure that we are on your list as the catering company.